Louisiana seems to have had more musicians and singers than just about any other state in the 60s. The supply seems never ending - and here's another fine artist who just had this one single released. Blessed with a deep dark baritone voice Charles Dixon does a fine emotional job on the ballad Come To Me. I just love the way he coarsens his tone after the bridge, injecting more bite into his performance. The rhythm section and horns are well arranged and the pianist gets a special tip of the hat as well. 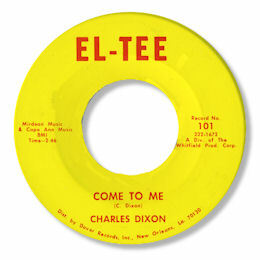 El-Tee appears to have had some connection with Lionel Whitfield's musical organisation so this 45 may well have been cut in Baton Rouge.